I ran across Oceans of Sound by David Toop at our local used book store and scooped that up. It’s still available as a new title. The publishing date is given as 2001 but the copy I have has a copyright of 1995. Even if it’s only current as of that latter date it’s a thoughtful and wide-ranging read. The only other interest I’ve had besides music that has lasted most of my lifetime is books. I used to travel for business and would always try to find a way to fit in a visit to at least one used book store in every city I was in. I gradually amassed an eclectic library of several thousand volumes. After I discovered computer music production, I started looking for books on the subject. The most interesting ones are the older ones, from the days when computers were only available to universities. 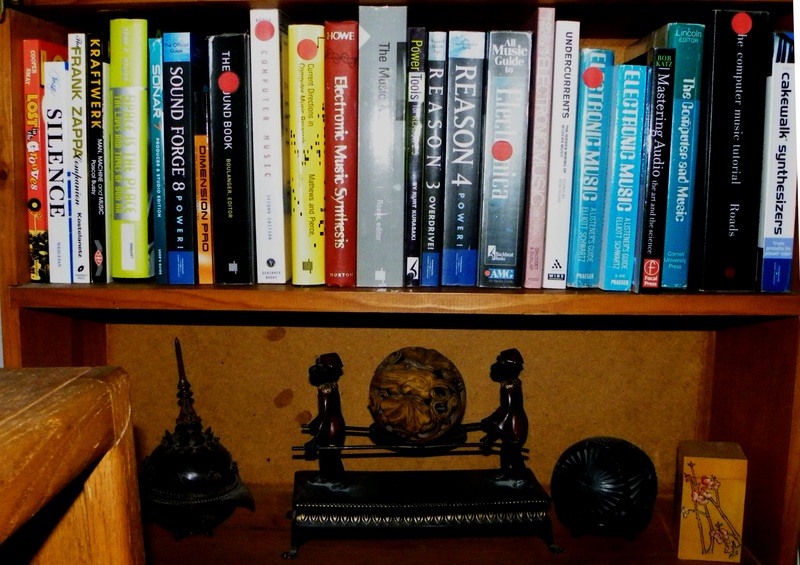 Here’s a snapshot of one of my shelves with some of my favorite reads. The book to the right of the red cover “Electronic Music Synthesis” that you can’t make out very well due to the flash hotspot is “The Music Machine” edited by Curtis Roads. This is a selection of papers from the Computer Music Journal up to 1988.